The PT50A is our PT50 Series crossover product with the industrial world. It is the only PT50 Series product that is warranted for commercial/industrial use (3 years). The PT50A features a heavy steel measurement platform, an industrial strain sensor, our fastest processor and 1 gram of resolution. The PT50A is a very versatile product. 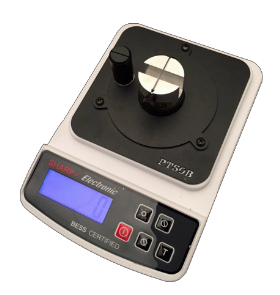 While it is rated for up to 3000 gram loads it will very accurately measure laboratory edges that measure only a few grams. This portable and lightweight design has already found it's way onto factory, hospital, and laboratory floors across the US. The basic PT50A package includes both our Aluminum Test Fixture and our Disposable Clip system (Test clips have not yet received full BESS certification) giving manufacturers, and those sharpeners who will have only the best, maximum latitude in measuring both standard and non-standard cutting tools and edges. This instrument is the direct replacement for our original PT50 which is currently at work throughout the US and 17 countries world-wide. With a faster processor and simpler operation the PT50B is the workhorse instrument for professional sharpeners, knife enthusiasts and woodworkers. The PT50B has a steel measurement platform and delivers 5 grams of resolution with a 1 year warranty. 5 grams of resolution is more than adequate for all the sharpening room discoveries you will soon be making! The PT50B includes a knife fulcrum and our Aluminum Test Fixture. The PT50B can easily use our Disposable Clip system if purchased separately. The clip system is not only versatile, super fast and simple but a real advantage for anyone with diminished eyesight and/or hand and finger dexterity. If you're a home chef the PT50C is our attempt to get you into the game. If you use electrics, pull-thrus, or sharpening steels to sharpen your edges we can promise that you are not slicing and dicing with sharp and durable edges - and not even close. Grinding metal away from a knife edge is exactly 1/2 of a sharpening job and all professional sharpeners are well aware of this fact. All home sharpening methods leave an edge killing burr that is firmly attached to and part of your recently ground knife edge and a PT50C will prove that fact! If you don't remove this burr properly, your knives will never be sharp. How will you know when the burr has been removed properly? Your PT50C will tell you! The PT50C was designed specifically for home kitchen use. It's 25 grams of resolution is all you need to distinguish, easily, between a sharp edge and a poorly prepared dull edge (and everything in-between!). The PT50C includes our super easy disposable clip system for taking measurements (BESS test clips have not yet received full BESS certification). 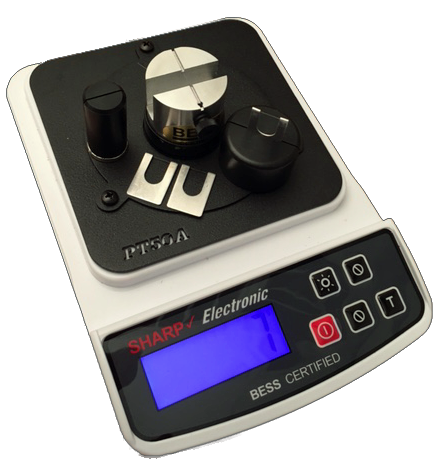 The PT50C makes the path to sharp kitchen cutlery easy to follow and if you'll purchase a SHARP PAD you'll have the tool on hand that fixes what your home sharpening system has left undone. All PT50 Series Instruments utilize EOU's exclusive "Max Force" analytical software algorithm to capture and log crucial edge information. 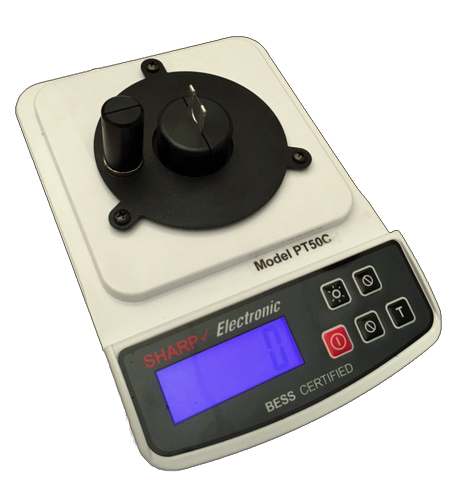 PT50 Series instruments use the same, quick & easy, three button operation and (2) AAA battery power (included). Engineered and certified Aluminum Test Fixtures include pre-loaded 125 measurement test media canisters and Clip Bases come with 25 disposable test media clips. Disposable test media clips do not yet have BESS Certification. All PT50 Series model instruments have been tested and certified by BESS Universal for use with BESS Certified Test Media canisters. The PT50 Series - if you are a professional, an enthusiast or a home sharpener...you're at the right place! in HD by clicking the logo next to each video. Not your same old knife forum. Thousands of posts by members on everything sharpening. Join in with us and help old friends create new ideas.